Ancient farmhouse which has been recently restored preserving its original architectural features and its ancient materials such as the charming terracotta-tiled floors. This property comprising 3 welcoming units (connected via an internal staircase) that are rented together as a private villa offering facilities of an independent property and at the same time providing privacy to the guests of the 3 apartments. Villa Terrazza is in quiet and panoramic location on the border between Florence area and the Chianti Classico region and it is part of a large estate with olive oil production and horse farm. Podere Terrazza offers spacious outside areas, a nice terrace and a beautiful pool set in dominating position among olive groves. The villa has simple, comfortable interiors furnished in a rustic style. The location is ideal to access Florence (only 12 km away) and at the same time to enjoy the Tuscan country-side. The property owners live on the premises and occupe a totally independent barn nearby. Distances: groceries 2 km away, Grassina general stores 6 km, high-way entrance (Firenze –Sud) 7 km, Ugolino golf course (18 holes) 4,5 km away, Florence center 12 km, Greve in Chianti 20 km, San Gimignano 55 km away, Siena 61 km away, Volterra 78 km, Lucca 90 km, Pisa (airport) 110 km away, Rome (airport) 293 km. The Versilia coastline area with nice beaches is 115 km away. At guests’ disposal: large outside areas, spacious furnished terrace, private swimming-pool (4 x 17 m – depth from 1,1 m to 2,1 m – open from 15/05 to 30/09 – from 6.30 to 21.00) with open-air shower (cold water only) and barbecue (20 m away). Laundry (€ 3,- / per washing). WI-FI internet connection on the terrace. The house provides mosquito nets. Extra Services: Baby bed upon request (€ 30,- / week to be paid on site). Maid service available by arrangement (€ 11,- / per hour to be paid locally). Upon request it is possible to organize Tuscan dinners and cooking classes (min. 6 persons). Lower floor: large living-room with dininga rea and access on to the outside, kitchen (oven, freezer, dishwasher), toilet, double bedroom with ensuite bathroom with shower and bathtub (a double sofa-bed is available in this double bedroom at an extra charge). Ground floor: double bedroom with access on to the outside, large and characteristic kitchen (freezer, oven, dishwasher) with dining table and fireplace, 2 double bedrooms with satellite TV, one with ensuite bathroom with shower, bathroom with shower. 1st floor: living-room (satellite TV) with double sofa-bed, 4 double bedrooms (2 with satellite TV), 2 bathrooms with shower. Great place. Very helpful and pleasant host. Nous avons passé une semaine dans cette maison en famille, nous étions 18 personnes de 6 mois à 71 ans et tout le monde a aimé la maison avec ses espaces et équipements. La maison dispose de 3 étages ce qui est tres pratique pour ne pas etre les uns sur les autres, et dispose aussi de 2 grandes salles à manger à l'intérieur et extérieur, ce qui permet de se réunir pour les repas. En termes d'équipement cuisine il y a vraiment tout ce qu'il faut et les draps et serviettes sont fournis. Maison à conseiller fortement, les paysages autour suffisent à nous évader et la proximity de Florence est un bon plus. We spent a week in this family home, we were 18 people from 6 months to 71 years old and everyone enjoyed the house with its spaces and facilities. The house has 3 floors which is very convenient not to be on top of each other, and also has 2 large dining rooms inside and outside, which allows to meet for meals. In terms of kitchen equipment there is really everything you need and the linens and towels are provided. House to advise heavily, the scenery around is enough to get away and Florence proximity is a good plus. Mooie locatie, lekker afgelegen. Zwembad ligt iets hoger en via een oude stenen trap en tussen de olijfbomen kom je daar. De eigenaar die lager woont heeft een hond. Schat van een beest en onze kinderen waren helemaal verliefd op hem. Aanrader! Beautiful location, nicely secluded. 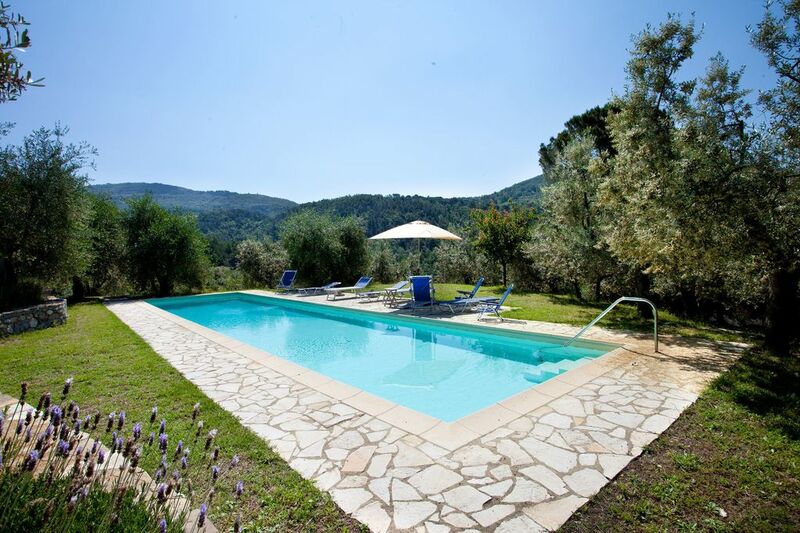 Pool is slightly higher and you get there via an old stone staircase and olive trees. The owner who lives below has a dog and our kids were totally in love with him. Highly recommended! la maison est parfaite pour plusieurs couples avec enfants . elle se situe au milieu des oliviers dans un paysage superbe à 25 minutes de Florence .Seul bemol les 150 euros de menage par semaine obligatoire qui ne correspond qu'a un changement de draps la premiere semaine .